It was just like 20 years ago. 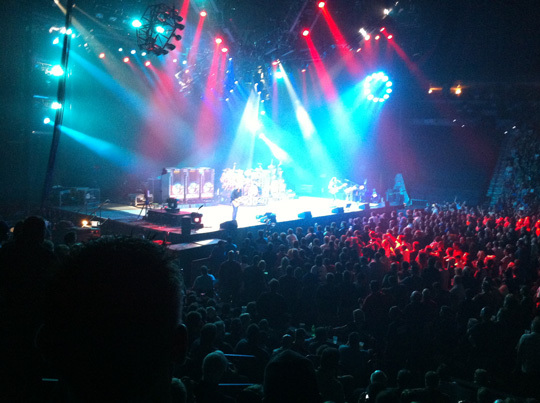 I went to see a RUSH, the Canadian power trio, concert with Brent a few weeks ago, but I forgot to tell you all about it. I’m sure you were disappointed, so let me make up for it now. It was awesome. They started playing at 7:30 and, except for a brief intermission when they took their Geritol, played straight through until 10:45. At one point they played the entire Moving Pictures album straight through. It was amazing. Brent’s high school classmate, Allen Runge flew up from Texas for the concert, and we talked to him during intermission. He had box seats. This means two things from what I could tell: (1) his seat was further away and (2) He had to sit down for the whole concert. Speaking of sitting down, I’m not a sitter at concerts. I much prefer the “rock on dude” concert scene. If you’re going to sit down, you might as well be in your living room. Luckily this was the general consensus of the people we were “sitting” around. Unfortunately, the rather large guy who was sitting behind me such that I was in a direct line between him and the stage did not share out feelings on the matter. He suggested that I sit down. I suggested that perhaps he was too old to attend concerts. He pointed out that he had paid $100 for a concert he was not able to see. Ultimately, Brent and I traded places with him and his, here I’m just assuming, wife. This, of course, obligated me to remain standing and him to remain seated for the remainder of the concert. We both understood this implicitly and proceeded to do so. Did the standing/sitting incident remind you of college? We all went to an R.E.M. concert and the really old people behind us (they were probably 30) wanted to sit. You and Karl ended up going somewhere else to stand. I sat. Then when R.E.M. sang “Stand”, the jerks behind us stood up! Arrrgh! I wanted to punch them. I did remember that (but I think it was Dave). We ended up on the floor and had a wonderful time. *sigh* I’m glad the dude didn’t punch your lights out. I believe I am an unintentional Rush fan. My brothers were big fans, particularly Phil, who would wear his headphones while playing the drum parts. (He’s a very good drummer.) If there could be a game show where you have to identify Rush songs by the drum line only -- I would totally clean up. I remember Alan! How is he? I think Devonna used to hang out with him. He seemed fine. I think Brent still talks to him fairly regularly. I said, “Say hi to Karen for me” and he didn’t look grief stricken or anything, so I assume she’s still around. But I prefer to sit now, preferably with my feet up. These older groups should have a ‘Recliner Section’ for folks like me. I can still ‘Rock on’ from the waist up…in fact, I’m pretty darn good at it. I do it at my desk most of the day. The geritol cracked me up. I LOVE RUSH! They were my first concert experience in 1986 (Power Windows) and I was fortunate enough to see them a few time. I haven’t seen them in years, though, and I was bummed that we missed their Boston show a couple of nights ago. I was introduced to RUSH by my very first serious boyfriend. And though I never saw a show with him, “Closer to the Heart” still reminds me of him every time I hear it.